A few weeks ago, I had a little problem. It was Wednesday and on Friday I was supposed to go on a tubing trip down the Delaware river. For the tubing trip, the website said that we had to wear closed toe shoes, specifically water shoes. Shockingly, I don’t own water shoes. So I looked some up on Amazon but they wouldn’t be delivered in time for my trip. 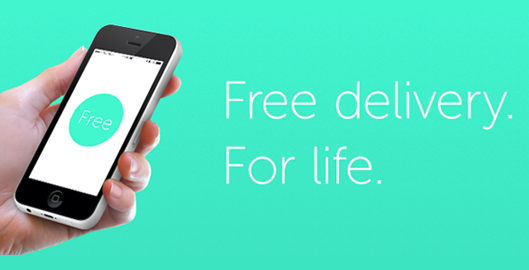 But then, I remembered two on demand delivery apps I have on my phone, WunWun and Postmates, so I decided to try them out. The premise of both of the apps is that you can place an order for any item from a store or restaurant, and it will be delivered to you very soon (normally within two hours). It’s great when you realize you forgot to get something that Amazon can’t deliver to you soon enough! First, I tried Postmates. Honestly, it didn’t go so well. The app crashed a few times. I couldn’t figure out delivery pricing. And I got frustrated and quit the app. So then, I tried WunWun. I opened up WunWun, placed my order, and within 58 minutes, I had my water shoes, and I saved a ton of time by not going to the store myself. First, I went to Google and a store in Manhattan that carried water shoes. 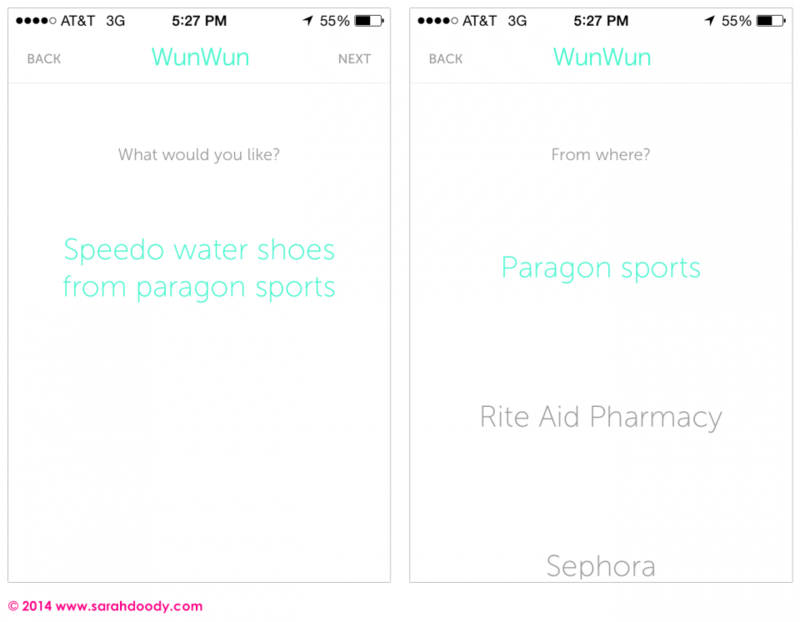 Next, I opened up WunWun and chose what type of delivery I was looking for (restaurant, product, other). Then, I entered the product I was looking for, store where I wanted it from, and the address they should deliver it to. After submitting my request, I received a text message from a WunWun agent asking if I had any questions. I definitely had some questions. 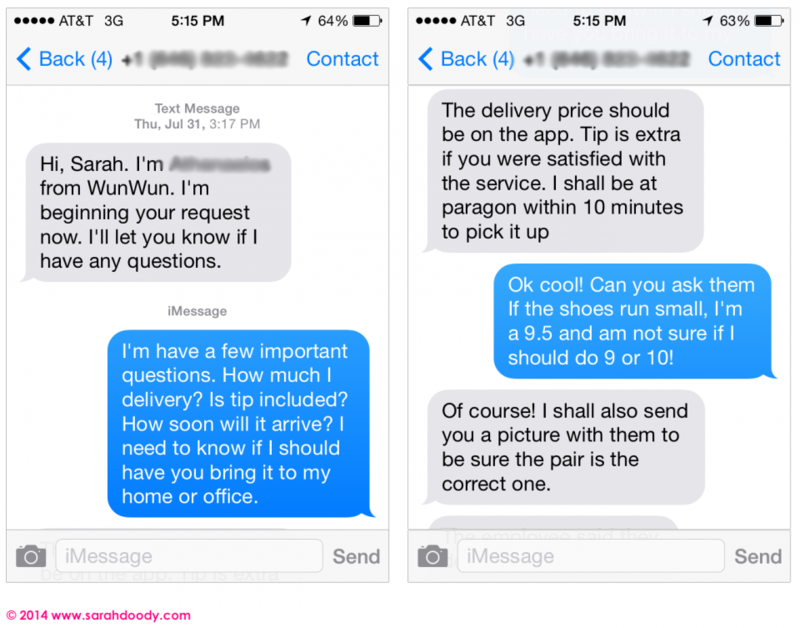 Within the app user experience of WunWun, it wasn’t clear to my if there was a delivery fee or how I would do a tip. I was concerned because I didn’t have cash and wanted to make sure I would be able to tip the person through the app. Next, I had a question about sizing. I texted the WunWun agent my question and they asked someone at the store. Very seamless experience and they also texted a photo of the water shoes to confirm it was the exact pair I was looking for. 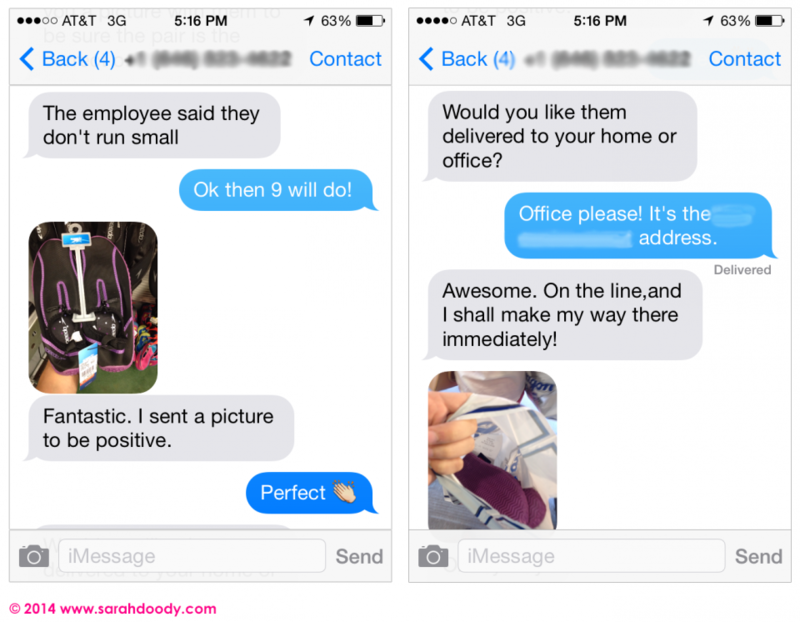 When he delivered the water shoes, I had to “accept” the delivery and add my tip on his iPhone app. When the WunWun agent arrived and I asked him how he liked working for WunWun. He said it was his first day on the job and my order was his very first order! He did a fantastic job and my feet were nice and protected on my tubing trip down the Delaware River … but that’s another story, as it was a near death experience because we were tubing in a huge thunder storm! After the agent left, I received a text message from WunWun asking me to rate my experience from 1 – 5. I love this feedback mechanism (learn more in my blog post about microfeedback) and don’t know why more companies aren’t using this very friction-free method of gaining insight into customer experiences. Back to WunWun though, a few things from a UX perspective that were a bit unclear to me. Pricing: As I mentioned earlier, the exact pricing was unclear to me. I realize this might be on their website, but as far as I can recall, when I was actually placing my order, there wasn’t a mention of delivery fees. Tipping: I wish that the app was more clear about tipping, specifically that tip can be done on the app versus in cash. As well, I really wish WunWun would suggest a tip amount. As a consumer, I have no idea how much these people are getting paid, so I want to make sure my tip is fair. Thinking about this, it’s a reason why I love Uber. Uber includes the tip, so I never have to try and calculate a tip or consider what a fair tip would be. Lack Of Details: I feel like the overall user experience of the app fails to address very specific questions that a user would have. I already mentioned pricing and tipping. But if you look back up at my screenshot of the app, in the first screenshot it asked “what would you like”, so I entered the product and store. But then, in the second screenshot, you can see that I’m asked what store I want it from. I’m guessing I’m not the only person to do this! I think that WunWun could stand to add some type of progressive navigation to show me where I am in the process. In this progressive navigation bar could be things like “Product > Store > Questions > Out For Delivery > Accept Delivery & Tip”. Errors: I got a lot of errors while in the app. Nothing that caused the app to crash. But I kept having to dismiss messages that I didn’t really understand. Would I use WunWun again? Absolutely, especially for things that Amazon can’t delivery to me soon enough! Get $5 credit when you sign up with my link: http://wunwun.com/signup/NORUUR … and heads up, I think it’s only availble in NYC right now!